I don’t usually use this blog to post personal stuff. I’m actually quite happy with how not bloggy my blog is. However, there is something pretty cool going on in my personal life this month: my wife is locked up in a NASA simulation pretending to be an astronaut on her way to an asteroid. That’s pretty cool, so I’ll make an exception for some non-standard blogginess. The HERA IX crew is still locked inside their habitat in Building 220 and JSC and hasn’t come out since they entered last Monday evening. Tonight will be their 10th night of 31 on their indoor camping trip. They are cut off not just physically but also virtually, with no outside communication besides mission control and a weekly family phone call. This is because one of the many experiments for this year’s HERA campaign has to do with the psychological and interpersonal aspects of being isolated with your fellow astronauts away from friends and family. If they were constantly connected via email, text message, or other forms of the internet, they could escape from that isolation and the data would not be the same. Unfortunately, this means we can’t hear from Leah and the rest of the crew about how they are doing! The last private family call I had with Leah, or Mission Specialist 2, was last Friday. At the time, they were on mission day 4 and the crew was doing quite well. Leah said the food was very good and that everyone was getting along. The food they get to eat is the very same food that the ISS astronauts eat from the JSC food lab. In addition, they are testing out some new types of food that may get used for future Orion exploration missions because they are denser, thus saving weight. Leah said that they had been so busy that they hadn’t had much time for down time like watching movies and reading books. Mission day 6, this past Sunday, was their first full day off so they may have got a little more relaxing in, unless mission control had some unplanned surprises for them like emergency drills! They are simulating as many aspects of spaceflight as possible including emergency drills, spacecraft maneuvers, spacewalks, and human experimentation. Just like the astronauts onboard ISS, they are doing experiments on themselves which involve saliva and blood samples, activity tracking, and all kinds of psychological and cognitive tests. Unlike the astronauts onboard ISS, they are wired up even more to get as much data s possible. Since Leah and her crew do not have real science to conduct like up on ISS, they are free to be encumbered by all kinds of trackers all over their body, including heart rate monitors, temperature sensors, and more. Meanwhile, I’ve been left alone at home with the dog, trying to pretend my wife is really an astronaut in space. Honestly, it really doesn’t feel like that. It does feel like she’s far away – even though I can see building 220 from my desk. What it really feels like is that she’s on deployment with the military or on some other kind of dangerous job where I can’t talk to her much. I know she is quite safe, and could come home anytime if she wanted, but I at least have a small inkling now of both what it’s like to be an astronaut’s spouse and also a military spouse. You really have to respect families that have this kind of separation as a normal part of their life. The meat of the mission is about to start. On mission day 11, this Friday, I get another private phone call with Leah (yay!) but then the HERA IX crew will go into radio silence for twelve days. The middle portion of the mission will involve a simulated communications delay with mission control as they are on “approach” to asteroid Geographos in deep space. In order to preserve the illusion, no private family calls will be allowed during the comm delay part of the mission. Their conversations with mission control will take at least several minutes round trip for every thing they say. That is going to feel like true isolation! So while I’ll be at home feeling a bit lonely, Leah will be getting to some of the most exciting parts of the mission! When they get to Geographos, they get to do their simulated EVAs and pick up asteroid samples for scientific testing. Leah is designated as “EV1” and gets to use the virtual reality gear to do her “spacewalk”. Pretty cool! I can’t help but be proud of my wife and the whole HERA IX crew. It’s one thing to sit at home reading spaceflight news and tweeting about it. Getting to work in mission control and monitor spacecraft health and status data is of course awesome… but all of that feels quite silly compared to putting oneself out there as a test subject and sacrificing personal comfort to help collect data that will be used to further exploration, which is exactly what the HERA IX crew is doing. I can’t wait for Leah to come home but at the moment, I wouldn’t rather her be anywhere else than where she is right now on the front lines of NASA’s Human Research Program. Go #HERAIX! There was a workshop in Houston last week for technical discussion about selecting future landings sites for missions to Mars. It may seem a bit premature, with NASA saying missions to Mars won’t occur for 20 years, but engineers would like to take advantage of the excellent capabilities of the Mars Reconnaissance Orbiter to get early high resolution imagery of potential targets. The US Congress passed a federal budget bill that avoids “continuing resolution” levels of funding for the rest of Fiscal Year 2016. The appropriations negotiations for specifics, like how much money NASA will receive, is not yet decided, but generally a budget provides more flexibility than a continuing resolution. Bottom line is that space policy fans have to wait to see how their favorite NASA programs are affected, but this is hopefully good news. Check out this article at The Atlantic that does a good job of explaining the complexities and nuances in the political battle over the construction of the Thirty Meter Telescope on Maunakea in Hawai’i. In rocket news, only one Chinese launch along with the launch of a new GPS satellite from Florida this past week. The next launch to the ISS will be a Cygnus resupply on top of an Atlas V rocket in early December. Later today, the first orbital launch from Hawai’i’s island of Kauai will take off from USAF’s Pacific Missile Range Facility. Up on the ISS, astronauts Scott Kelly and Kjell Lindgren got to go on their first EVA ever! The EVA had a variety of tasks (it was in fact referred to here at mission control ambiguously as simply the “ISS Upgrades EVA”). The guys get a second walk outside later this week on Friday, November 2nd. Meanwhile, on November 2nd, NASA marked 15 continuous years of habitation onboard the ISS. The Cassini spacecraft conducted one of its closest flybys of Saturn’s icy moon Enceladus, passing within 30 miles of the surface and flying right through the “plumes” of water ice flowing out from the subsurface ocean. A recent astronomical study of Europa – an icy moon of Jupiter with an ocean, much like Enceladus – revealed areas on the surface that appear to have a unique composition, probably caused by the sea water mixing with the surface ice. A very large asteroid (2,000 feet) called 2015 TB145 flew past Earth this past weekend at a distance of about half a million kilometers. Heres a radar image of the rock; here’s some videos of the flyby. The New Horizons spacecraft has conducted the first of its course correction thruster firings needed to reach its next target – a small Kuiper Belt object flyby in 2019. I am back from a little “fall break”. This post should catch you up on the big things that have happened since my last post in September. George Mueller, head of NASA’s Office of Manned Space Flight in the 60s, died at an age of 97. There is at least one book about his contributions to the space program available on Amazon. Estonia is now a full member of the European Space Agency. A watch worn by Apollo 15 commander Dave Scott on the surface of the moon recently sold at auction for over one million US dollars. This is not one of the Omega Speedmasters which were given to all the crews (all of which are now owned by the Smithsonian). Instead this was a backup Scott wore when his Speedmaster broke. An Israeli team called SpaceIL has secured a launch contract on a Falcon 9 rocket for their entry in the Google Lunar X Prize. Blue Origin announced that it will center its launch operations at Cape Canaveral. NASA dropped a large archive of photos from Project Apollo to Flickr. It’s been a busy month of rocket launches. Since my last post on September 26th there have been nine successful launches to orbit: one by India, three by China, one by the European Space Agency, two by Russia, and two by America. Only one of those launches was in support of International Space Station operations: an unmanned Progress resupply mission from Russia. You can see a great list of all launches at “2015 in Spaceflight” on Wikipedia. In addition to the launches, the Japanese HTV-5 cargo vehicle was successfully undocked and deorbited from the ISS during the last week of September. Other happenings on the ISS included a debris avoidance maneuver on September 27th, some cubesat deploys, the Progress docking, Scott Kelly breaking the record for most days in space by an American, and some great imagery of Hurricane Patricia. 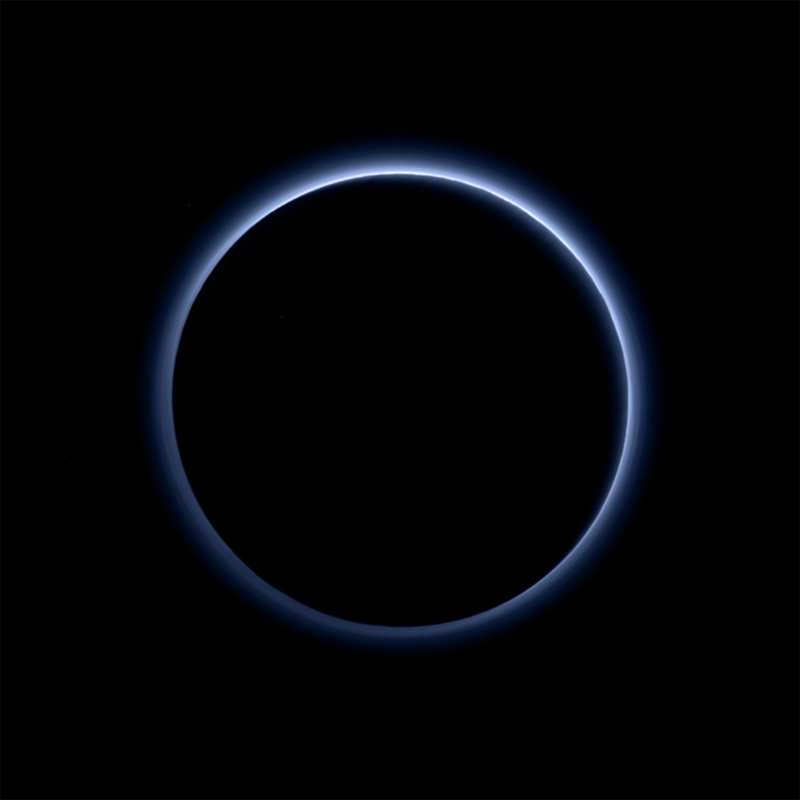 Science data from the New Horizons flyby of Pluto continue to come in, including this awesome picture showing the blue glow of the planetoids thin atmosphere. NASA made a big announcement at the end of September about Mars research, revealing that the Mars Reconnaissance Orbiter had imaged evidence of water flowing (intermittently) on the surface of Mars. While previous NASA missions had confirmed that water is present and had flowed in streams and rivers in the ancient past, this is the first evidence of a modern water cycle. As usual, Emily Lakdawalla has excellent coverage. NASA is posting daily images of the Earth from the DSCOVR satellite to an interactive website. A rather large Near Earth Asteroid (NEA) at 500 meters across will buzz the Earth-Moon system on October 31st, but is not in danger of impacting our planet. Sorry for the delayed post this week. It has been a busy month, as I prepare for my trip to the 31st Space Symposium in just over a week. Plus, I recently got a new Amazon Kindle and have been diving into the world of spaceflight historical fiction (I know, I was surprised too!). I recently finished reading both Zero Phase and Public Loneliness by Gerald Brennan. Check them out! The most exciting space news since my last post on March 20th of course was the launch of Soyuz TMA-16M last Friday. Here’s a video of the launch. More on what’s been going on ISS under “In Orbit”, below. United Space Alliance is having a public contest to vote on the name of their new rocket, which they hope will replace their medium lift Atlas V and Delta IV rockets by the 2020s. Speaking of naming contests, the SETI Institute has launched the “Our Pluto” campaign for the public to help suggest names for features on Pluto, which will soon be discovered by the New Horizons spacecraft. From what I can tell, NASA and the IAU are onboard, so the names may actually become official. Ellington Airport, just a few miles from the Johnson Space Center, has a new agreement with Sierra Nevada Corporation to land unmanned Dream Chaser spaceplanes here in Houston. If Sierra Nevada is awarded the CRS-2 contract, this could provide a nice logistical advantage for the ISS program. The next SpaceX Falcon 9 launch, which is another cargo resupply flight to ISS, has been delayed to April 13 (a 3-day slip). NASA has selected “Option B” for the Asteroid Redirect Mission (ARM). The mission will involve an unmanned robotic mission retrieving a small boulder from the surface of a Near Earth Object (NEO) which will be visited later by astronauts in lunar orbit. Lots of rocket launches in late March, in addition to the Soyuz launch that sent Scott Kelly, Mikhail Kornienko, and Gennady Padalka to ISS. The list of launches includes: an Atlas V with a new GPS satellite, A Japanese reconnaissance satellite on an H-II rocket, two European Galileo navigation satellites on a Soyuz rocket, and at least one other Indian, Russian, and Chinese rocket. The Chinese launch reportedly included a test flight of a new mini-space plane. The number of rocket launches this year now stands at 21 to orbit, with no failures. The possibility that the bright spots seen by Dawn on Ceres are in fact plumes of some kind. Awesome high resolution images of Mercury, as MESSENGER moves into the last month of its mission. New evidence for past hydrothermal activity on Mars, which may lead to key sites to search for life. I was excited to learn that there are still astronomers diligently watching the Alpha Centauri system, with HST even, to try to confirm the potential worlds detected orbiting there several years ago. The latest data indicates that perhaps there are two worlds, not just one, orbiting Alpha Centauri B. Unfortunately, the data is not strong enough to say they are there for sure… yet. February 2nd is “budget day”: when NASA will announce the preliminary 2016 budget request for the agency as proposed by the White House. Rookie European astronaut Andreas Mogensen has been posting video blogs of his training for launch. The latest entry is posted from Moscow and focuses on the Sokol spacesuit which is worn in the Soyuz. The European Space Agency has a new unmanned spaceplane they plan to launch on a technology demonstration on February 11th. The IXV, or Intermediate Experimental Vehicle, has been undergoing launch preparations at the launch site in French Guinea. Speaking of ESA, here’s their Week In Images, which is always a good click. SpaceX has announced in a statement on their website that they are essentially dropping their lawsuit against the U.S. Air Force over the Evolved Expendable Launch Vehicle (EELV) contract which awarded 36 rocket launches to United Launch Alliance (ULA). SpaceX and USAF have apparently made a deal which allows USAF to honor current contracts with ULA but also work to certify SpaceX’s rockets soon and open competition to them for future payloads. SpaceX also released a new animation to stir up excitement for the first test flight of their Falcon Heavy rocket later this year. And in the last SpaceX news from last week, the company completed a static fire test on the launch pad in Florida in preparation for their next launch on February 8. The Planetary Society has secured a launch aboard an Atlas V rocket this May for their LightSail solar sailing prototype. I am super excited for this mission! Check out this great video explaining the spacecraft. Last week Wednesday, the ISS did a “deboost”, or an orbital correction maneuver to slow/lower the orbit. Usually we do reboosts to keep the orbit higher as the ISS is slowly degraded due to drag. In this particular case, the trajectory officers found a deboost the best solution for upcoming trajectory needs, and we had the extra propellant that we could afford it. I was lucky enough to be assigned the early morning shift on Wednesday to command the OPM (Optimized Propellant Maneuver) to spin the ISS around in preparation for the burn – which went well later in the day. And here is a selection of a few other great shots from ISS over the last week. If you want to follow Twitter posts from the ISS, follow my list, “people in space,” which I will always have updated with any astronauts who are tweeting from ISS. Three launches occurred in the last week, bringing this year’s total up to 5 launches. NASA’s Soil Moisture Active Passive (SMAP) Earth-observing satellite was the third launch of the year – and third from the US – but almost didn’t beat a Japanese launch and then a Russian launch due to a scrub first for weather and then for technical issues. They finally got off the ground from Vandenberg Air Force Base in California on Saturday morning. Here’s a video. The other two launches were this morning, Sunday, February 1st. Japan launches a spy satellite on an H-2A rocket (the same rocket that sends the HTV cargo vehicle to ISS) and Russia launched a communications satellite on a Proton rocket from Kazakhstan. This was the 5th successful Proton flight since their most recent failure last May. Newly released high resolution images from the Rosetta spacecraft reveal a rather large crack in the comet 67P/Churyumov-Gerasimenko. Could the comet split in two when it gets closer to the sun? Exciting! The image release also included some new shots of the Philae lander descending to the comet from the perspective of the orbiter. As NASA’s Dawn spacecraft gets closer and closer to the solar system’s largest asteroid, Ceres, it is now returning images of the world that are better than what Hubble has shown us in the past. Adidas is releasing a spacesuit-inspired shoe. In early January, Boeing announced that it will be leasing Orbiter Processing Facility 1 (or OPF-1 to NASA) near the VAB at KSC for launch processing of their X-37B spaceplane, which flies secret missions for the United States military. There are three OPFs at Kennedy Space Center. OPF-3 is already under a lease contract by Boeing for processing of their CST-100 crewed space capsule. CST-100 is one of three spacecraft (along with SpaceX’s DragonRider and Sierra Nevada’s DreamChaser) competing for commercial ISS crew transport contracts with NASA. Speaking of the commercial crew contract, Sierra Nevada announced in January that they will be purchasing a United Launch Alliance (ULA) Atlas V rocket for an unmanned test flight of the DreamChaser in 2016. The launch would be from existing ULA launch sites at Cape Canaveral Air Force Station in Florida. Also launching in 2016 is the first part of the European ExoMars mission. The core module of the European Space Agency’s (ESA) ExoMars Trace Gas Orbiter was delivered in Germany last month. ExoMars is a flagship ESA mission to explore Mars, which will consist of an orbiter, a lander, and a rover. A LEGO model of NASA’s Mars rover Curiosity was launched in early January. Since operations at KSC are ramping up for new spacecraft (like the Orion flight this fall) the VAB will be closing for tours on February 23rd. I am very happy to have seen space shuttle Endeavour in the VAB back in 2011. The small town of Webster, adjacent to NASA’s Johnson Space Center here in the Clear Lake area of Houston, is planning an ambitious visitor center that will pay tribute to America’s space program and feature an 80-foot tall astronaut statue. Former astronauts Jerry Ross and Shannon Lucid will be inducted into the astronaut hall of fame this year. Up on the ISS, the first official Orbital Sciences’ Cygnus cargo mission arrived on January 12th. The private spacecraft is expected to stay another week or two before departing and burning up in the atmosphere. Meanwhile, SpaceX had another successful Falcon 9 version 1.1 launch, putting a commercial payload into geosynchronous orbit. Their next launch is a Dragon cargo spacecraft on its way to the ISS, with a plethora of other launches on the manifest for this year. The ISS flight was recently moved to a March 16 launch. On Mars, a big anniversary happened last month. January 4th was the 10-year anniversary of Spirit landing at Columbia Memorial Station and just a few weeks later Opportunity landed at Eagle Crater on January 28, 2004. Today, Opportunity is still trucking along at Endeavour crater, after driving over 35 kilometers since landing. Pretty good for a rover expected to live 90 days and drive maybe a kilometer or two. There were a lot of NASA media events and discussions of the missions online. Universe Today put together a list of the top 10 discoveries made by the MER rovers. The Smithsonian National Air and Space Museum is running an exhibition on the MER rovers through September. For some nice retro entertainment, here’s the landing video from 2004. Most of the exciting stuff is in the first minute or two, so you don’t have to watch all 8 minutes. Opportunity is currently on the rim of Endeavour Crater – where she has been exploring since 2011. She has had some mild winter weather and is expected to make it through the solstice coming up in February. While exploring some rock outcrops at her winter stop point, Opportunity did a bit of a piroute and noticed something strange. In an area that had already been imaged by the rover, sat a new mysterious rock. Leading theories initially were that it could be a fallen meteorite or ejecta from a meteorite impact somewhere nearby. Other theories are that it was simply dislodged by Opportunity’s wheels and simply “kicked” or dropped into the new location. An interesting mystery for the 10 year anniversary. 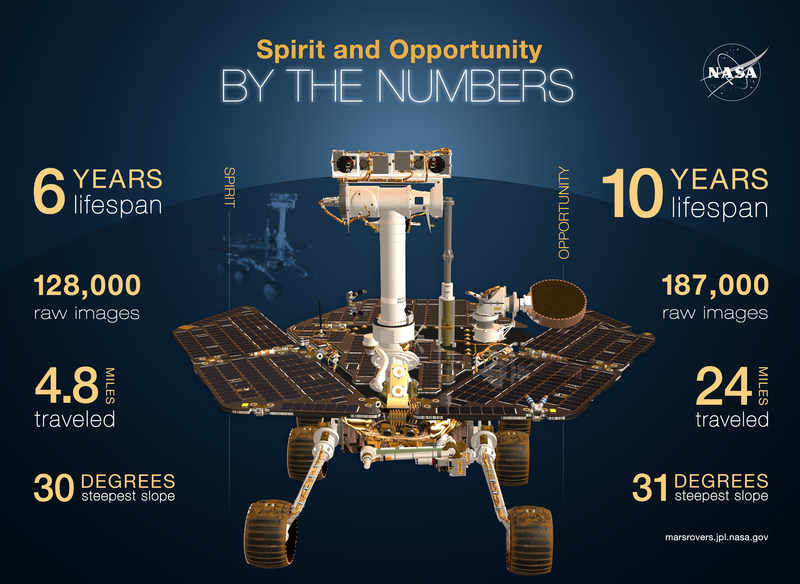 Rove on, Opportunity! Meanwhile on the other side of Mars, the younger but much larger Curiosity rover is navigating the “Dingo Gap” on its way to Mount Sharp and was currently parked atop a sand dune when I started to draft this post early last week. Nice view. Since then, Curiosity has successfully made it over the dune into the “valley” beyond. Curiosity is getting closer and closer to Mount Sharp, but spending lots of time stopping to do science along the way. While waiting to cross the dune last week, the rover team released a stunning image of Earth in the Martian sky, as photographed by Curiosity on a clear twilit day. Beautiful. Speaking of rovers, on the moon, the Chinese rover Yutu headed into its second lunar night in late January. Unfortunately, reports from the Chinese space program are that the rover suffered some kind of mechanical anomaly and is in danger of not surviving the two week “night”. It seems that some of the mechanical systems that are supposed to fold up the solar panels to provide thermal protection for sensitive components did not work properly. There has been no new news since the first reports more than a week ago. We will likely have to wait until “morning” on the moon (sometime next week) to know the rover’s fate. Farther out in the solar system, the European comet-chasing spacecraft, Rosetta, has been woken up from hibernation. The spacecraft will be approaching comet 67P/Churyumov-Gerasimenko later this year and in an exciting and challenging mission will drop a lander onto the comet’s surface. A new sensitive camera on the Gemini telescope in Hawaii took an impressive infrared light image of the distant planet Beta Pictoris b. This kind of direct imaging is certainly the future of exoplanet astronomy. The NEOWISE mission (a re-purposing on the WISE infrared orbital observatory) has found its first near-Earth asteroid. Astronomers at the European Southern Observatory were following up on an interesting binary star system, two brown dwarfs only a few lightyears from Earth, when data suggested that the star system contains a third companion, a jupiter-mass planet. More study is expected to confirm the planet’s existence. Hello, and Happy New Year! Thanks for stopping by while you are hopefully enjoying a New Year’s break with friends or family. Last year, my 2012 in Review post was a link style post of discoveries made, missions launched, and heroes lost throughout the year. Reading that post again, it doesn’t give a real feel for the lay of the land, or the lay of space, if you will. Therefore, in the spirit of New Year Resolutions, this year I resolve to spend some extra effort and write a more op-ed style summary of 2013. So read on to get my impression of the triumphs, losses, and curiosities of 2013 as I see them. I have never liked the phrase “mixed bag”, but that’s really what the world of spaceflight has been over the past 12 months, especially if you have a balanced interest, as I do, in Earth science, planetary science, manned spaceflight, and commercial development. Space exploration is dominated by NASA and its government-given budget. Therefore, it is hard to ignore the impact of the American government’s indecision and disagreement when it comes to NASA funding, and the impact that has on our industry as a whole. 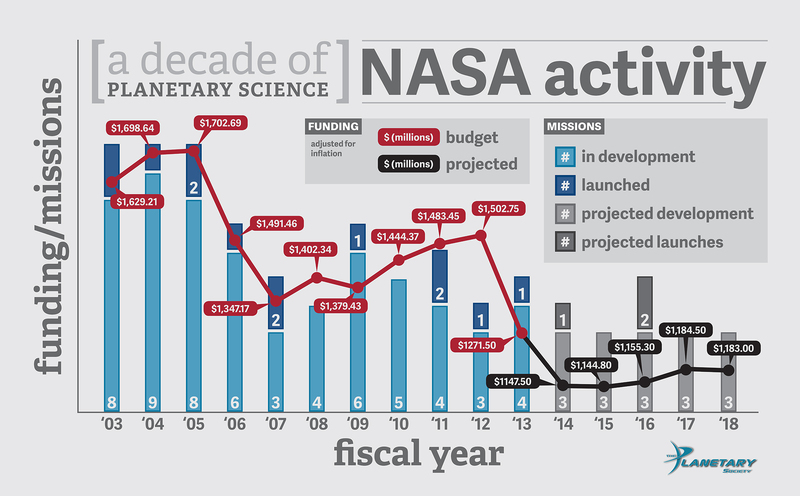 NASA continues to get a relatively flat budget, which stagnates growth. But you can’t begrudge the American government too much for this – most people agree that our federal government should do something about the deficit; all agencies are being asked to do with less. The story of 2013 isn’t that NASA is getting a flat budget, it is specifically how NASA has chosen to distribute that money. NASA continues to generously fund the growth of commercial resupply missions to ISS as well as the development of a new exploration system consisting of the Orion crew capsule and the SLS rocket. When combined with the annual operating budget of ISS, this exploration funding amounted to around 44% in both 2013 and 2012. We can see the results of this spending in a very successful year for SpaceX and Orbital Sciences (one successful ISS resupply flight each and 3 other combined test flights and no major failures) and the steady progress that the Orion capsule is making towards the first flight next fall. However, on the other side of the agency, Planetary Science has slid from 8.5% to 6.7% of the budget (here is my source for budget numbers). This doesn’t sound like much, but the dollar amount is nearly $300 million less than the planetary science community is used to. What this led to in 2013 is the beginning of the budget squeeze; it looks as though the coming decade will have far less new planetary science missions than the American public has gotten used to from the golden ages of funding in the 1990s and 2000s. I know you probably like pictures, because I do too, so here’s a chart from the Planetary Society that can help put it into perspective. As you can see, less money means fewer missions. The reason 2013 was full of great science results and pictures, despite budget woes, is because of the funding that launched so many great spacecraft over the past 10 years – MER rovers, Curosity rover, MESSENGER, Cassini, Juno, New Horizons, all of the Mars orbiters, Dawn, MAVEN, LADEE, LRO. All of these spacecraft were built and launched under an earlier year’s budgets. This highlights the core contradiction of where we found ourselves in 2013 in planetary science. Stunning pictures from Saturn and Mars come in daily from Opportunity, Curiosity, and Cassini, while planetary scientists are very concerned about the future. As NASA funding is funneled into the James Webb Space Telescope and the 2020 Mars rover (both missions I hope to see launched! ), the American expertise when it comes to solar system exploration may, for a time, be funneled through the camera lenses of just a few spacecraft. The Curiosity rover (and her older sometimes forgotten sister Opportunity) continues to inspire the enthusiast and layman alike. Budget or not, NASA has a mastery of robotic exploration, and demonstrated it in 2013 by continuing to operate missions successfully. NASA did lose two missions in 2013 – Kepler and Deep Impact/EPOXI – but both had technically fulfilled their primary missions. While planetary science missions are usually the “best foot forward” for NASA, 2013 showed us that the public still loves our astronauts and finds manned spaceflight worthwhile. As I wrote last year, 2012 was the year that NASA’s astronaut office realized the importance and potential of online social media. The active ISS crews in 2013 took this to heart and turned Expeditions 34 and 35 during the first half of the year into an internet sensation, mainly due to the charismatic presence of Commander Chris Hadfield on Youtube and Twitter (here’s a Flickr stream of Hadfield’s mission). Hadfield was special in that he combined the constant joy of being in space (which is not unique to him at all) with an open and emotional personality, a desire to share, and artistic talent. That last one locked in the “sensation” part. All impressive for someone who is first – professionally – a fighter pilot. If NASA is crafty, it will take advantage of the enthusiasm for Hadfield and the ISS program before it has time to fade (which I hope it won’t!) and direct it into support for future programs like SLS and Orion and the Asteroid Retrieval and Utilization mission. In case you missed it, the ARU is the plan to send a spacecraft to a Near Earth Asteroid, capture that asteroid, and return it to Earth, all with human astronauts aboard. The ARU was announced by NASA leadership in the spring of 2013. As I wrote about in late April, the plan got somewhat less excitement from the public than was probably hoped. The problem with ARU, and NASA’s current approach to manned spaceflight overall, is context and an end goal. When asked to explain the initiative this spring, NASA stated that the mission will integrate the best of our science and technology, while utlizing the new Orion and SLS systems, while at the same time keeping “…NASA on target to reach the President’s goal of sending humans to Mars in the 2030s.” The question is, is NASA’s focus on planetary defense and asteroid deflection or is it just an excuse to test technology for going to Mars? NASA leadership is quoted as saying that Mars is a priority and that the moon is not even being considered. Yet, no clear internal roadmap or guiding set of priorities outlines the timeline and rationale for future exploration missions. Instead it often feels to the public like NASA is searching for missions to justify new hardware, rather than the other way around. It may very well be that NASA knows where it is going, but is simply in the necessary doldrums. Stuck in between manned launch vehicles (the dreaded “gap”) there is a lack of inspiration for the public. NASA may just need some results, some action, when it comes to these grand future plans, and the public will jump onboard. Orion’s first (unmanned) flight is less than a year away. The Exploration Flight Test (EFT-1) will send Orion up to almost 4,000 miles to test out the heat shield on a blazing fast re-entry. Will this mission inspire and excite? It is possible. It could be that more results and less talk will cause the roadmap to also become more clear. For now, talk is cheap, and that is essentially NASA’s problem – lots of talk, and a cheap government. Talk is also cheap in the continuously emerging private sector, and yet somehow they seem to inspire somewhat more excitement. I will explore the new private initiatives of 2013, and their impact on the spaceflight industry, in part II of my 2013 year in review.